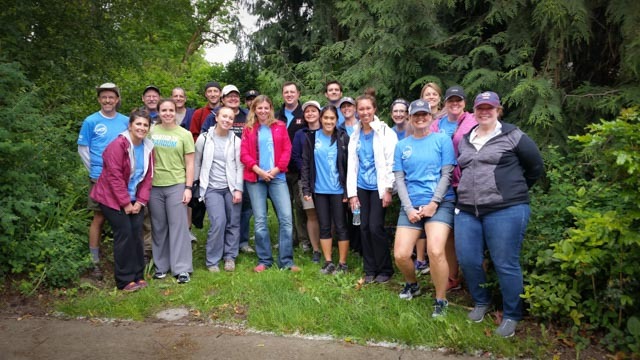 With a very pleasant day of good weather and a crew happy to get out of the office, Liberty Mutual / Safeco employees spent the May 4th in the Community Garden and Orchard at Meadowbrook. The Give with Liberty campaign donated time to mulching the apple orchard, edible hedge and east orchard, which was a big success. Folks also made their presence known in the community garden. Weeding and mulching was also tackled on the flower shaped community garden, as all the rain and sunshine created ripe conditions for their ‘harvest’. Employees from Seattle and Portland represented their company well. Visiting employees also were in attendance. Employees from Kentucky, Boston, Philadelphia, Dallas and New York also offered up their time to MCGO. Many thanks to everyone for the positive vibe and great work!